Mumbai Lake Position Put up on Mumbai Page.. This IMD Image, super imposed with "A" and "B" by Vagaries, shows 2 distinct developments !I project this satellite image with winds movement to make things easier to explain. On the left (A) is the developing low, as indicated by the wind directions around it. Getting ready in the next 24 hrs. On the right (B) is the Monsoon cloud. The SW winds near the coast between the clouds and the mainland is fairly convincing indicating the SWM to move into Kerala in the next 48 hrs. B1 now seen as a low 1t 996 mb, merged with the trough. Moved N/NE as expected and at 20.4N and 92.6E today (Friday). Rains expected in coastal regions to be heavy. Larkana and Mohenjo Daro touched 50c today (Thursday, 31st May). Vagaries had been predicting and anticipating this since the last 2 days. Sukkur soared to 49c, and Dadu and Sargodha were 48c. Sukkur saw a low of 31c. Yesterday vagaries had estimated a rise in the region for Thursday. In India, Churu was hottest at 48.7c, Allahbad was 47.8c. Amritsar was just short of its all time record by 0.2c. It was 47.6c on Thursday. Brahmapuri was also at 47.6c, Agra at 47.1c, Gwalior 47.0c, Chandrapur saw 47.0c. Delhi Palam baked at 47.0c, and S'Jung was sizzling at 45.4c. Kota bottomed a low of 33.8c and Nagpur 33.7c on Thursday morning. Orissa was spared the extreme heat for the second day today. At least it was not as hot as it was before last Tuesday. Highest was 45.5c at Bolangir followed by 45c at Sundargarh. B-1 has moved N and was centered at 18.6N and 91E. It has not intensified much, and still remains as a UAC. Rainfall regions are very much restricted to the Eastern coast of Bangladesh and adjoining India.as yet. Should move N/Ne and track into Bangladesh, maybe just settling down as a low. 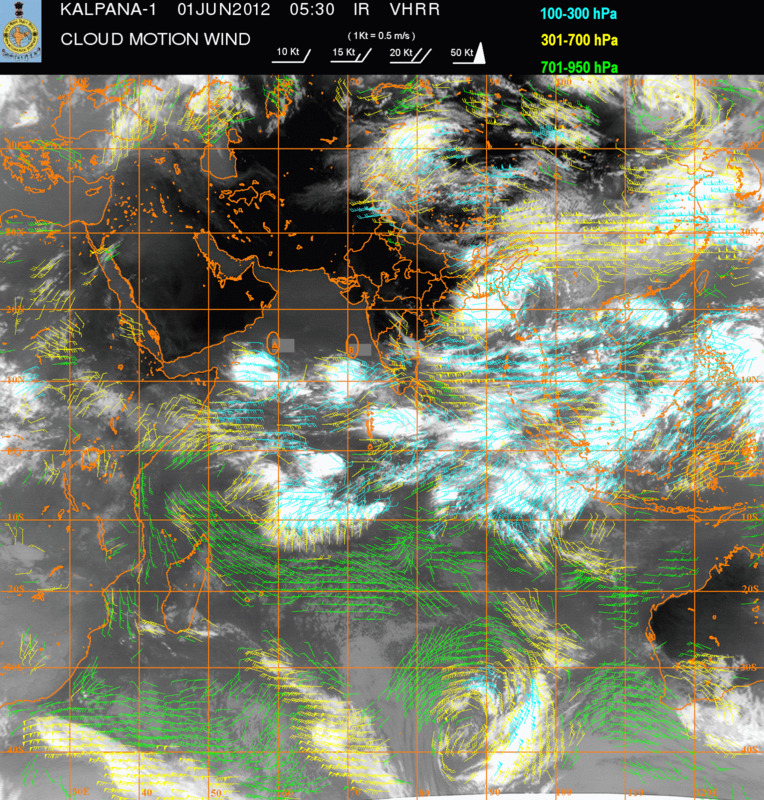 The low in the Arabian Sea should form by the 2nd of June. The low formation clouds are seen near the 57E 10N region. In the interim period before the low takes shape, I expect the SWM to advance into Kerala around the 3rd of June, as thick clouding has also concentrated south of the Lakshadweep Islands. Subsequent events will take its course as described yesterday. For those interested, the Vagaries' Daily Weather Readings from Breach Candy, Warden Road, South Mumbai have been recently put up on a special Page on this Blog. Thanks for the update and drizzle news. Yes ! It is as per latest Mumbai vagaries put up on 29th May. So even this year we had arabian sea low in first week of june. Looks like it will give good rain along the west coast and southern parts of gujarat next week. Mumbai might get 15mm rain on 6th & 7th june. But as you said earliar no rain for interior maharashtra & karnataka, so will this rain be called monsoon or pre-monsoon rain? Sir when the Surat will receive its first premonsoon or monsoon shower? svt/shitij/pavan: It seems you may have mis understood my explanation of the course and track that the low will take. I have mentioned that the low will NOT hit land, It will move N/NE and fade away before hitting land in the sea. No question of moving towards any coast. It will fade away in 2/3 days. It will pull the SWM current, as per dates given in vagaries. Initial rains will be pre monsoon, till the actual SW winds set in. Surat can get first pre onsoon rain around 5th June. svt, why the interiors will be getting lesser rains is also explained. pavan, interiors will get showers later, no, low will not bring rains there. Are there any chance of rain in Delhi in coming few days from WDs or pre monsoon? This heat has become unbearable. When is the monsoon expected here? early/late/normal arrival? @rajesh why the cities of gujarat r in normal range ,,,wen adjoining rajasthan and nw india is getting baked in the unforgiving heat,? ?,,,also wen i was seeing the weather of himachal cities i noticed that the diurnal range of kullu to be very unusual max 36 nd minimum 15?? ?why is it lykk tht,,on the contrary in manali the diurnal range is nt vry much!! by recording 34.9 mangalore breaks it previous record of 34.8!! this year may in panvel was quite manageable,,during the start of the month the minimums were below normal! !but since 3-4 days the heat and humidity has started!! hi, rajesh there were pre monsoon showers early in the morning at borivali and vasai.